"A delicious way to add more veggies to your diet! This recipe is very versatile. You can change out the greens with whatever you want. Chia seeds give you added protein and energy. Hemp seeds will give you a boost of omegas!" 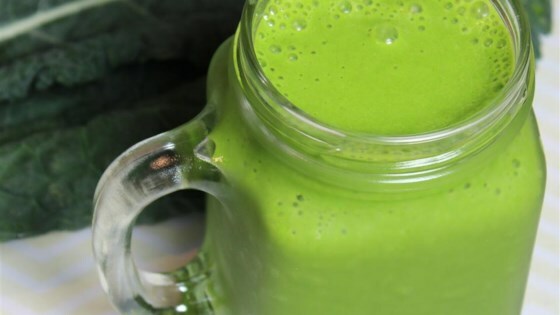 Blend spinach, almond milk, peanut butter, chia seeds, and kale together in a blender until smooth. Add banana and blend until smooth. Try these healthy, hearty spinach and kale balls. No chia seeds, and I added ice because my banana was not frozen! Delicious!! Kept me full for 4 hours (and I'm 7months pregnant), great accomplishment :) thanks!!! I used 1 cup frozen kale and on cup frozen spinach, I just thawed it with some warm water. I didn't have any chia seeds, but it still came out really tasty. I only used a teaspoon of peanut butter, and it was still delicious! Mostly tasted banana and peanut butter, it did a good job of covering up the freshly cut grass taste!